A Easter cartoon I shared on my Facebook Page and Pinterest has gone haywire. It’s not my cartoon, but it certainly generated likes, tweets, and repins and reshares. I laughed a little too hard when I saw this cartoon from Tim Davis (leadershipJournal.net/cartoons). If you like it, share it. I spent a majority of last week teaching missionary students with Youth with a Mission in Barquisimeto Venezuela. Due to the security situation in that city, I was asked to teach a class in an online format all week along. 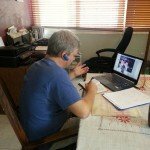 I’m growing more comfortable teaching in Spanish. I want to say thank you to our supporters who donate to fund our Latin American mission work. My next teaching will be in Nicarauga at the end of this month. If you’d like to know more about how to support this ministry, please contact me and I’ll share more info. As to this week’s Friday Finds, here are some good ones I encountered. 1. A Church Greeter Training Tip. 3. Training all your greeters by ‘shadowing’ your best greeter in the church! Some might say, “Really one month for training greeters?” My reply is “Yes!” If you don’t take training your greeters seriously you won’t have a good greeting ministry. One man said, “Remember practice does not make you perfect. Perfect practice makes you perfect.” Train your greeters right the first time and then you will have greeters who can train others correctly. Justin Knowles gives a comparison list at a youth ministry blog of 9 different reasons by small groups help his student ministry. Weekends are a great conversation starter for students. But small groups are where the conversations can continue and where spiritual growth can happen. They are where transformation happens. They are where leaders can push, encourage and challenge students in their faith and really open them up to what God has planned for them. 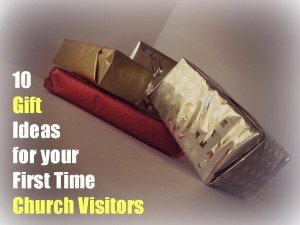 One of the most popular articles on EvangelismCoach is an early one that presents a 10 gift ideas for first time guests. I think it’s time to update that list with a new one. Have you read my book Church Greeters 101? I’ve heard from a few of you by email. If the book has helped you, I’d love to hear from more of you about how you are using Church Greeters 101.